There have been six major conventions this year in our state. I know I keep writing that fact in this space over and over again, but it’s something that’s boggled my mind all this year. It’s a profound time for the local otaku community, one that’s grown from roots in anime and manga to encompass general animation and sci-fi/comic culture as well. You’d think a friendly neighborhood anime/manga blogger would be having the time of his life with all these cons coming in. Yet as the year’s worn on — and it HAS been wearing on me; note how I’ve only had the energy to write fragments of posts about Con-athon 2015, that period between September and October where we had events going on for five straight weekends — the storylines, and figuring out what to write about and not write about here, have become increasingly complicated. Sure, the first half was just fine — Kawaii Kon was Kawaii Kon, Comic Con Honolulu was a nice sci-fi/comic twist on the Kawaii Kon formula, and HawaiiCon was the vacation-with-some-con-fun of my dreams that I’d really love to return to next year. But then things took a turn for the strange. Amazing Hawaii Comic Con proved that at my age, there really IS a cap on how many attendees and lines one can tolerate before wanting to run screaming back to the safety and solitude of the Otaku Ohana home office. A few weeks after that, Anime Ohana went in the opposite direction, snatching the title of “the state’s most intimate con of the year” away from HawaiiCon (albeit likely unintentionally). Two screenings of Little Witch Academia: The Enchanted Parade (touted as the “U.S. premiere” on the schedule, although Trigger representatives screened the finished OAV at Anime Expo earlier this year), at 3 and 7 p.m. Saturday. On the other hand, there are a number of factors that have hurt the convention. It’s going up against Black Friday and the opening weekend of the Christmas shopping season. Two major craft fairs — the Winter Craft Fair at the Hawaii Okinawa Center in Waipio Gentry, and the Islandwide Christmas Crafts and Food Expo at the Blaisdell Exhibition Hall — will also be running over the weekend, meaning some vendors who might have been all-in for AMHI are instead either selling at those craft fairs or splitting staff and merchandise among shows. Then there are the events touted on the convention’s website in March that disappeared over the next eight months and aren’t on the final schedule — Club AM (advertised as a late-night dance party for the first two nights of the convention), AM Idol (a talent competition), a formal dance, an anime music video competition and a car show among them. A few days ago, the maid cafe was converted to a cosplay recovery lounge. “Nerdlesque,” a show combining burlesque performance with geek culture, morphed into “Intro to Nerdlesque,” a panel in which Chuu talks about the show. Finally, while I was working on this post early Thanksgiving afternoon, it was announced that cosplayer Yuegene Fay would be canceling her previously announced appearance due to problems with her U.S. customs and immigration paperwork. Those are easily chalked up to, and forgiven by, logistical issues. But perhaps the biggest elephant in the room, the one that’s spawned an online petition calling for a boycott of everything Anime Matsuri LLC touches and a fair amount of discussion in social media, are the allegations of sexual harassment and general malfeasance levied against con directors John and Deneice Leigh based on what’s happened in Houston and several other places. The Houston Press, an alternative weekly newspaper (think of it as being like the old Honolulu Weekly), ran a pair of articles on the subject; you can read them here and here. You can look up many of the main players and their blogs elsewhere on the Internet if you so choose. It is what it is. I respect those people’s views, and I can understand why they would want to boycott the show. I also know there are volunteers on the AMHI staff — people who have joined and have stayed on despite knowing this info — who are working hard to present the best show to their attendees this weekend. If I were a full-time blogger rather than a full-time copy editor/page designer who fits blogging in between Tsum Tsum and Ingress sessions and trying to rest and recuperate from all that editing and designing, I certainly would have liked to have had a sit-down with the Leighs to talk about the allegations. But I’m not, and as a journalist by trade, I don’t feel it’s fair for me to pass judgment on covering or not covering a show unless I gave them a chance to respond first. And so, the show goes on, and I’ll give them the benefit of the doubt for now. If I hear anything otherwise, though … we’ll see. If you’d like to join me at the show, prices at the door are $60 for general-admission 3-day passes; $25 for children’s 3-day passes; $30 for Friday passes; $35 for Saturday passes; and $25 for Sunday passes. After the flurry of activities that was Con-athon 2015 — five straight weekends between September and October, five convention or convention-like festivals — you’d think we’d be getting a breather with the holidays approaching. You’d be wrong. Ohhhhhhh so very wrong. Anthem of the Heart: There’s one more screening of this tale from the Anohana creative team of a girl with words sealed away in her heart: noon Saturday at the Consolidated Ward Stadium 16 theaters. Here’s a trailer. I already mentioned this in my last post, but since then a new review has popped up on Fandom Post. Spoiler alert: It gets an A+. A home video release can’t arrive soon enough for me. Ghost in the Shell: The New Movie: Not to be confused with Ghost in the Shell: The Original Movie, Ghost in the Shell 2: The Kinda Confusing Sequel to the Original Movie, or Ghost in the Shell: Stand Alone Complex: Solid State Society: And This One’s Based on the TV Series, this particular installment follows up on the events of the four-part Arise OAV. 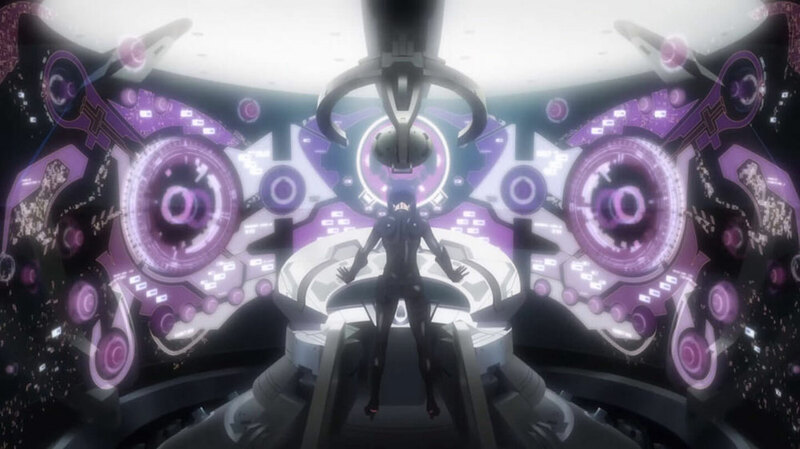 The prime minister of Japan is dead, the Fire-Starter virus continues to infect Ghosts, and Major Motoko Kusanagi and the members of Section 9 must untangle the complex web of government corruptions and shadowy figures to figure out what’s going on. Hawaii International Film Festival: There’s only one anime in this year’s HIFF Fall Showcase (Nov. 12-22). 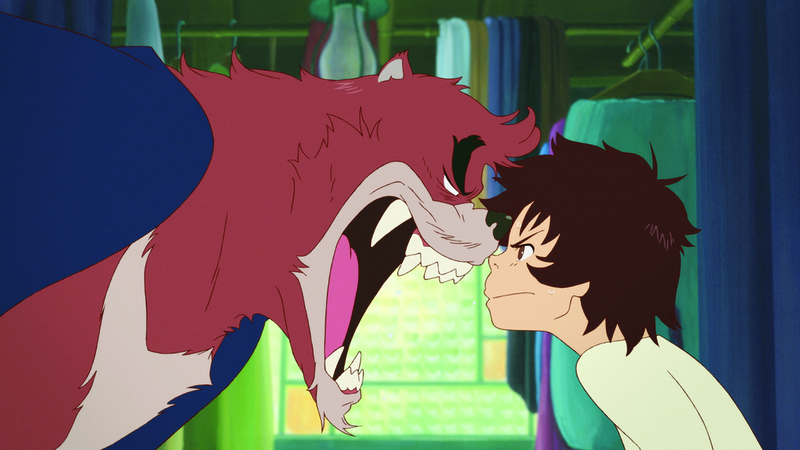 Fortunately, it’s the latest project from one of the best creators still around since Studio Ghibli went dormant: Mamoru Hosoda, director of the great The Girl Who Leapt Through Time, the sublime Summer Wars and the sounds-great-but-it’s-still-on-my-pile-of-things-to-watch Wolf Children. His latest movie, The Boy and the Beast, features loner Kyuta (side note: I seem to be writing a lot of synopses these days where the main character is described as a loner of some sort, aren’t I?) 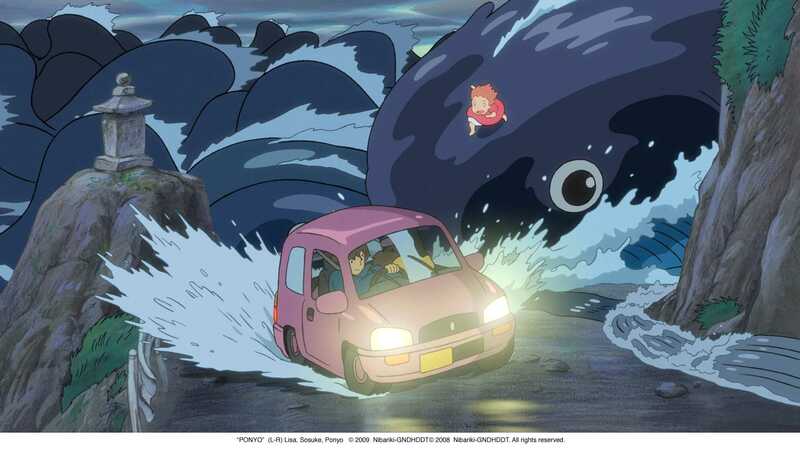 embarking on an adventure-filled journey with Kumatetsu, a supernatural beast also isolated in an imaginary world. Also, for those of you who enjoyed Journey of Heroes, the comic book recounting the achievements of the 442nd Regimental Combat Team and 100th Infantry Battalion with chibi characters, author Stacey Hayashi has a pair of projects screening as part of this year’s “Made in Hawaii Shorts” roundup: “The Surrender Call,” based on Military Intelligence Service linguist Herbert Yanamura’s actions to save civilians during the bloody Battle of Okinawa, and “The Herbert Yanamura Story,” in which he shares his story and reunites with someone whom he saved from that battle nearly 70 years later. “Made in Hawaii Shorts” screens at 5:45 p.m. Nov. 16 and 10:45 a.m. Nov. 21 at the Dole Cannery theaters, and 3 p.m. Nov. 22 at the Consolidated Koko Marina theaters. If anyone reads this blog on Kauai, you guys can see these shorts, too, at 10:30 a.m. Nov. 21 at the Waimea Theatre. “Short Story: Drawings by Brady Evans”: I’ve been covering the work of Brady Evans for quite a while now, from his days winning MangaBento art contests to starting art groups to curating an exhibit about manga in Hawaii to buying pretty artwork by him on display in art shows downtown, and probably a whole bunch of other things in between. Now Brady’s going to have an exhibit of his drawings on display at my alma mater, Punahou School, and I’m thrilled not only because I get to swing by there and see his work, but also because I can stop by the lily pond near Thurston Chapel. Fishies! Turtles! The occasional confused duck! I usually only plan on visiting once a year during the school’s annual malasada fundraiser for scholarships — you know, the Punahou Carnival — so this is a bonus visit for me. Kirsch Gallery (next to Cooke Library); opening reception 3:30-6 p.m. Thursday, exhibit on display through Nov. 19 (gallery hours 11 a.m.-3 p.m. Mondays through Fridays). Call 943-3247. … just kidding. I’m just feeling guilty that I have yet to do any write-ups for the events that were part of that five-week Con-athon 2015 I mentioned earlier in this post. 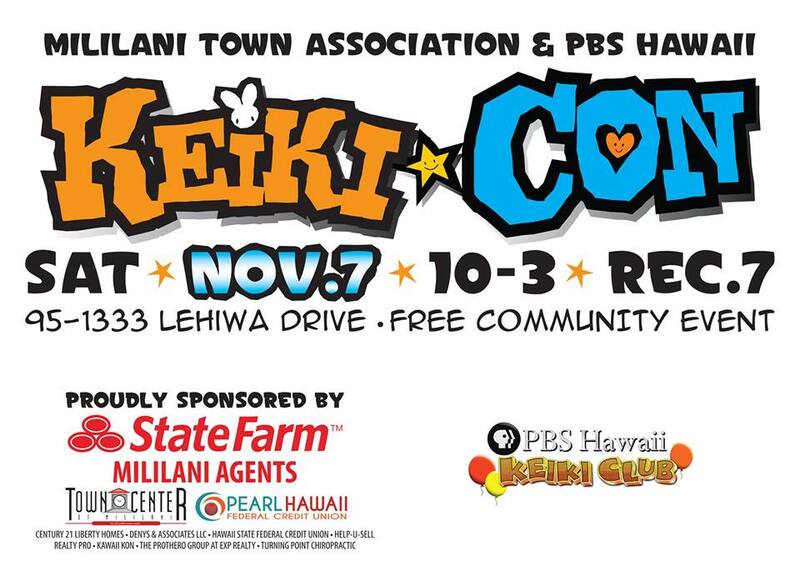 This event up in Central Oahu seems like it’s going to be a really fun time for keiki of all ages, with food trucks, games, various activities, a cosplay contest (register by 1 p.m. the day of the event); the Hawaii Game Truck; and an Artist Zone featuring make-and-take activities and Pineapple Man artist Sam Campos, Gordon Rider/Ara-Rangers/Edamame Ninjas/Star-Advertiser “Calabash” artist Jon Murakami, and Aumakua: Guardians of Hawaii artist Christopher Caravalho. Kawaii Kon will be on hand to give away free three-day passes (update 11/6, 5:30 p.m.: a pass will be awarded to the winner of the cosplay contest), too. Mililani Recreation Center 7 (take the H-2 Freeway to the Mililani Mauka exit, then shoot pretty much close to the top of Meheula Parkway; it’s at 95-1333 Lehiwa Drive, for you GPS types), 10 a.m. to 3 p.m. Saturday. Comic Jam Hawaii: It’s the holiday season, which means this group of collaborative cartoon artists, ousted by preparations for Santa Claus and giant holiday trains at Pearlridge, is hitting the road this month. They’ll be at Aiea Library — home of the monthly Polar Bear Cafe & Friends Anime Club and the Face of Hawaii Ingress ™ — on Saturday and Nov. 21, from 1 to 4 p.m. The library is at 99-374 Pohai Place … and have I mentioned there’s still plenty of parking? What’s that? I mention that every time I mention there’s something at Aiea Library? Well, then. Call 483-7333.